Send in your soundtrack for the 2016 CES (Computer Electronics Show) held in Las Vegas. The deadline to submit is September. You have time to read the guidelines and begin composing. You don't have to be a geek but if you're a musician , this may be the opportunity of a lifetime. As technology and music grow together, more talent emerges. International CES celebrity guests were present throughout the world's largest annual technology trade show. Over 176,000 attendees came together in Las Vegas. Radio and TV Host, Entrepreneur Nick Cannon has served as Ambassador for the last few years for the Entertainment Matters Program. There were celebrity guests promoting technologies in film, television and music. Those who are famous and I mean famous -- were seen holding a spotlight on the very products each endorsed. Long lines were not uncommon at the times autographs were given out. CES embraces technology and the arts as technology evolves and innovations continue to change the way the world connects. There are hundreds of exhibitors who show up with products not even out on the market yet. Gibson always has a beautiful display and the welcome mat is out for all attendees. Gibson has a big white tent outside the conference center . Their presentation of musical instruments brings crowds to hear music and even play some on display. The entertainment the past two years I attended was a welcome break for food, drink and song. Rapper and Investor Curtis "50 Cent" Jackson signed autographs at the SMS Audio Booth. 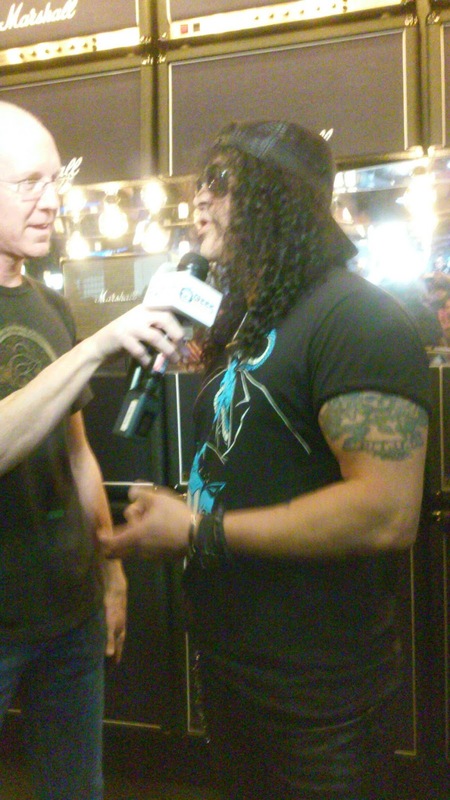 I got up close with other press members to see SLASH, Velvet Revolver -- who I knew as guitarist for Guns and Roses. Slash endorses Marshall Headphones. The gathering was open to press members and all attendees (willing to wait on a long line). Slash is a fine guitarist musician. Recently, he released some information that Marshall may introduce a smartphone. *Link below for contest rules and submissions.